Filmed at the 1980 Paris concert, the blazing heavy metal masters unleash 13 searing songs, including "Live Wire" "Highway to Hell" and "Let There be Rock." Year: 1980. Director: Eric Dionysius, Eric Mistler. Starring: Phill Rudd, Ronald Belford Scott, Cliff Williams, Angus Young, Malcolm Young. Love this concert,it's AC/DC @ their very best.When's it coming out on DVD ? Classic rock concert video needs to be on DVD! Since I've retired my VCR and turned to the DVD side of The Force, "AC/DC: Let There Be Rock" really needs to be on the new format. This video is a true rock classic and a must-have for any serious AC/DC fan. Filmed in Paris from one of the band's last concerts with legendary screamer Bon Scott, "Let There Be Rock" shows why AC/DC was recently labeled by Q Magazine as "The #1 Band You Must See Before You Die". The sheer energy and ferociousness of Angus Young's performance is truly a wondrous sight to behold. And the rest of the band keeps chugging along with an intensity that few rock bands have had either before AC/DC's late 1970's/early 1980's heyday or since. The interviews are pointless, but amusing to see Angus & Co. get more and more fluthered as the film goes on. In particular, Bon Scott displays his legendary charm (and his forgettable stage wardrobe). Scott's charm might come as a surprise to the casual onlooker, particularly for a man who penned Shakespearean sonnets like "Big Balls", "Beating Around the Bush" and "Up to My Neck in You". No matter, I once showed this video to my twentysomething neighbor who listened to nothing but 2Pac and the Wu-Tang Clan. He quickly became an AC/DC convert after laughing hysterically at Angus' on-stage antics and being wowed by his incredible guitar virtuosity. Great Movie But Too Many Interviews! Let There Be Rock is the 1979 concert in Paris put on by the legendary rock band AC/DC with their original lead singer Bon Scott. The concert was in support of the album Highway To Hell and a year later Bon would be dead and AC/DC would have the biggest seller of there carear with Back In Black, but this one's about Bon. The video is a blend of concert fottage and interviews with the band. The set list includes some of the bands hits like Highway To Hell, Rocker, Sin City, and Whole Lotta Rosie. Watching this vid really puts you up close with the band and gives you an insight as to the inner workings. The interviews and back stage fottage is a double edge sword becouse as usual Bon and Lead guitarist Angus Young give the bulk of the interviews. Some of the questions borderline on inane like "Are you waiting for the third world war? ", seem very foolish and forced but the movie has its moments of fun. The on stage fottage is fantastic and Bon comes off as both charming and affable. Angus and Malcolm Young (Angus's brother and backing guitar) along with Drummer Phill Rudd and Bassist Cliff Williams work in such perfect harmony with each other that it's not hard to see why AC/DC has such staying power. There will never be another Bion Scott ..
A classic concert from 1980 with Bon Scott!! An awesome classic concert for sure! I'm glad they finally decided to release this on DVD! Best of what AC/DC is all about! This is one true headbangin' good time captured on tape. Angus rips through solo after @ss-kickin' solo as Malcolm, Phil, and Cliff lay down the ballbustin' rhythm. Aside from an incredible concert full of calssic tunes played to perfection, this video, for me anyway, is FUNNY. One can't help but to laugh manically at Angus's slow, rhythmic stripdown before he moons the audience, (the funny aspect being the fact that he's really, really ugly). The first time I saw it, I just rolled on the floor. The second funniest part in the film would have to be the attempted "interviews" with each band member. With the exception of Bon, the interviewer asks his questions, and subsequently gets the same response from each member: a five second blank stare, followed by "Ummm...", "Yeah", or "I-uh... I don't know." Harsh as it may seem, it's just flat out funny. It's a great show - spine-tingling, but it REALLY REALLY needs to be released in dvd format so it can be truly appreciated. Today, I suppose, the borderline-inarticulate interviews would be set aside in a separate chapter on the DVD, but it was produced for presentation as a videotape. The message was/is the music, and I believe they leave "it" all on the stage. Warning - This DVD is not a concert, it is a documentary! 5 years after most of these reviews and STILL no DVD!! "Back in Black" not withstanding, AC/DC have never even come close to equaling what they produced when Bon Scott was alive. And from their beginning to the final Scott album, the classic "Highway to Hell", they just seemed to get better and better! And here we have an entire concert from that tour, filmed in Paris, which shows them at their absolute peak and includes backstage and interview documentary footage! And, on top of all that, it's quite simply one of the GREATEST Rock and Roll concert films ever made...so WHERE'S THE DVD?!?!? I thought this would be one of the first things they released when DVDs became mainstream, after all, it didn't take long for it to appear on stereo hi-fi VHS in the mid-1980s and I even saw it for rent several times. But to this day, the VHS is all we have!! And that simple fact is one of the great mysteries of the modern media rock era! I captured and burned this on a DVD-R myself but, as anyone who has ever done that knows, it's a little grainy and stereo is the only audio option so the lack of a re-mastered professional release with 5.1 or 6.1 sound is nothing short of unacceptable! (At least I was able to re-mix it while capturing it so it sounds a little better). And, sorry, "Family Jewels" comes close but, if you're happy with that, you've never seen "Let There Be Rock"!! The song list is below and, yes, each song is featured in its entirety, this isn't one of those pieces of garbage that only show snippets of songs before going back to the documentary footage. Bottom line: DVD or no DVD, if you like Rock and still own a VCR there is NO EXCUSE for not already owning this tape. Especially since good used copies are widely available for under $10 including shipping! I was REALLY dissappointed with this DVD set! If you have MTV and/or VH1, you've already seen it. I own the original Let There Be Rock on VHS, with Bon Scott. This concert is NOT on this DVD set!! THIS SHOW'S AC/DC WITH FRONT MAN BON SCOTT. A TRUE SHOWMEN. THIS VIDEO WILL LET YOU KNOW THE TRUE AC/DC. THE YEARS WITH BON SCOTT. ONE THE THE WORLDS BEST FRONT-MEN OF ROCK AND ROLL..
my absolute favorite concert film ever!!!! 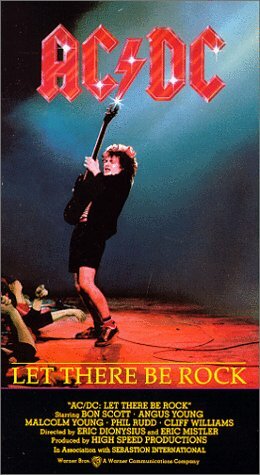 I ordered this back in 1987 and waited a while to get it...this is what a AC/DC show is all about...it's funny seeing Angus totally stoned during some of the interviews...good concert..to bad you can't get the footage from the apollo theater when they were on tour back in 1978... "riff raff" shows up in the family jewels collection..that would be worth buying.. There are several attempted and downright useless interviews with the band members which end up getting cut into the concert footage. Bon must have started with a huge tumbler full of booze for his interview, but the cuts are out of chronological order. Thus, you see Bon's glass full. Then almost empty. Then some ways down. Back to almost full. Up, down,up down.